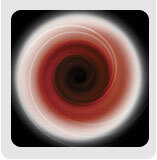 --Universe Forum--Black Holes--Do they really exist? Black holes have been discovered throughout our galaxy and elsewhere in the universe. They say that truth is stranger than fiction, and it turns out that nature is stranger than science fiction. More than a dozen black holes have already been discovered in our Milky Way galaxy - out of more than a million black holes estimated to exist there. And a giant black hole, heavier than millions of stars, has been discovered at the center of our Milky Way galaxy. The same picture appears to hold for other galaxies in the universe: black holes scattered through the galaxies, with a giant black hole at their center. Black holes turn out to be the most powerful objects in the universe. Exploring them is one of the truly exciting frontiers of astronomy. Matter that comes too close to a black hole – matter such as gas and dust, or even a whole star – is drawn towards the hole. As the matter spirals in towards the edge of the hole, it heats up, reaching millions degrees before plunging into the black hole. When gas is this hot, it glows in X-ray light, and can be seen by an X-ray space telescope such as Chandra. This glowing disc of gas is a fingerprint for the presence of a black hole. Giant jets of matter – the most powerful beams in the universe – are observed to shoot out from a galaxy's core at almost the speed of light. 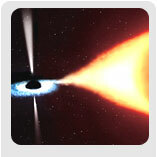 The only known source powerful enough to produce such jets, is a giant spinning black hole. The jets seem to originate from just outside the black hole's edge ("horizon"), where temperatures and magnetic fields are at their most intense. How the black hole creates these jets is not known. The gravitational field of a black hole tugs on the stars in its vicinity. A super-massive black hole will make whole swarms of stars whip around as they fall under its influence. By following the motions of the orbiting stars, astronomers can deduce the location, and size, of the central black hole they cannot see.